The impaired driver convicted of killing London's Sarah Payne, 42 and her five-year-old daughter Freya on the 401 has been sentenced to eight years in prison. A judge handed down the decision Monday in a St. Thomas courtroom following a series of emotional victim impact statements. The impaired driver convicted of killing London's Sarah Payne, 42 and her five-year-old daughter, Freya, on the 401 has been sentenced to eight years in prison. A judge handed down the decision Monday in a St. Thomas courtroom, following a series of emotional victim impact statements. Hubert Domonchuk killed the pair Aug. 29, 2017, on Hwy. 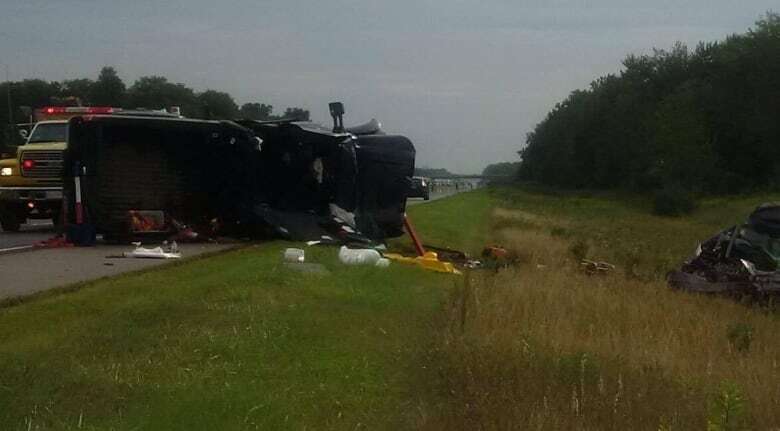 401 near Dutton, west of London, when his east-bound pick-up truck crossed the centre line and crashed into their westbound van. The Payne's six-year-old son, William, and Domonchuk were treated in hospital. Domonchuk, of Cambridge, Ont., faced several charges including two counts of impaired driving causing death, two counts of dangerous driving causing death, and marijuana possession. Domonchuk pleaded guilty and apologized on Monday to the family and friends of Sarah and Freya Payne. "My apology will never be able to make things better," he told them in court. The Crown and Domonchuk's lawyer have jointly agreed to an eight-year sentence. Tears began flowing and sniffles could be heard before victim impact statements began in the sentencing of Domonchuk. Friend and neighbour, Karen Conway, described Freya Payne as a spark-plug, and even bought her a super-hero suit for her birthday one year, believing Payne was destined to do powerful things for good. Another friend, Christine Wilton, called Sarah Payne "beautiful, calm and positive" while describing little Freya as "the life of the party." Crown attorney describes aggravating factors in collision... Domonchuk had a poor driving. Had 43 prior driving related offences. At the time of accident was impaired and had cannabis in his possession. He was speeding, 120 km/hr in a 100 zone. Sarah's father, David Miles, described his grief as something that is now in his bones and is all-consuming. He told the court, Sarah made him a better father and a better man. Freya, he called, "the light in the family." Miles' final words were, "Mine is a life sentence." Before the crash that took the Paynes' lives, there were signs that Domonchuk was careening toward an incident. The court heard Monday that Domonchuk had 43 prior offences under the Highway Traffic Act, something the Crown said indicated an "irresponsible attitude toward the privilege of driving." On the day of the crash that left Freya and Sarah dead, Domonchuk tailgated another vehicle, gave the driver "the finger" and forced the driver to swerve. Later, investigators discovered multiple bottles in Domonchuk's truck, including a partly-drunk 40 of Smirnoff vodka, two bottles of Crown Royal and a 2-litre bottle of Diet Coke. In hospital, a nurse discovered a vial on him that contained cannabis resin. As far as mitigating factors, the judge noted Domonchuk pled guilty, only has one prior criminal offence and appears to otherwise be in good character. The Paynes' crash renewed calls for concrete barriers to be installed on the section of the 401 highway darkly nicknamed "Carnage Alley." Transport trucks have crossed the median nine times between 2014 and 2017, killing six people, according to the Ontario Provincial Police. Alysson Storey, a friend of the Payne family, started a petition after the crash calling for barriers between the east- and west-bound traffic lanes on the 401 near Dutton. The province has moved ahead with the installation of high-tension cable barriers, which the Ministry of Transportation of Ontario says will be completed by 2021.